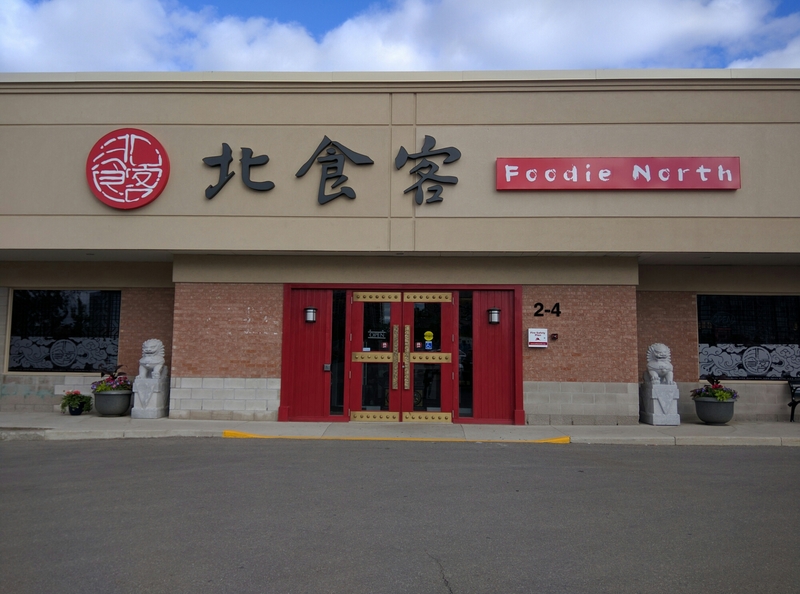 Foodie North just opened their doors! I’m so happy! I’ve waited so long for it to open. 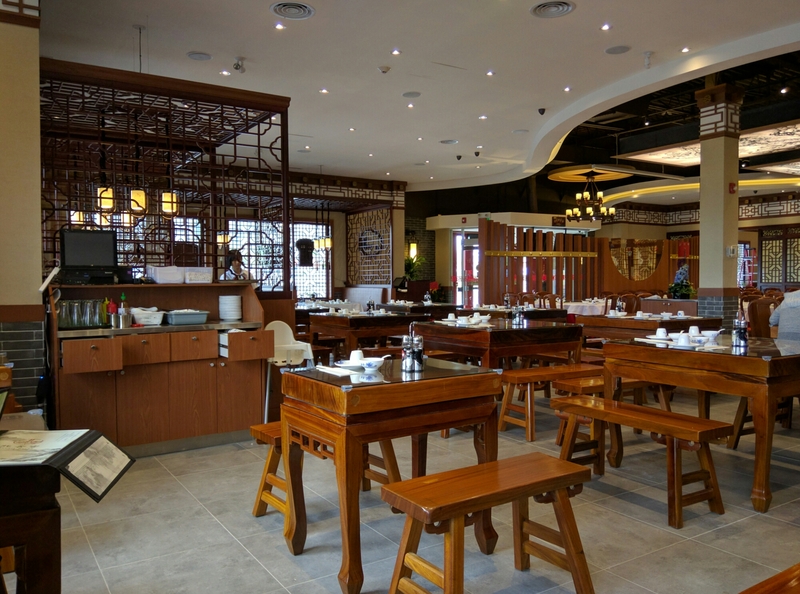 In case readers have not heard of Foodie North, it’s a new Chinese restaurant offering Northern China cuisine. 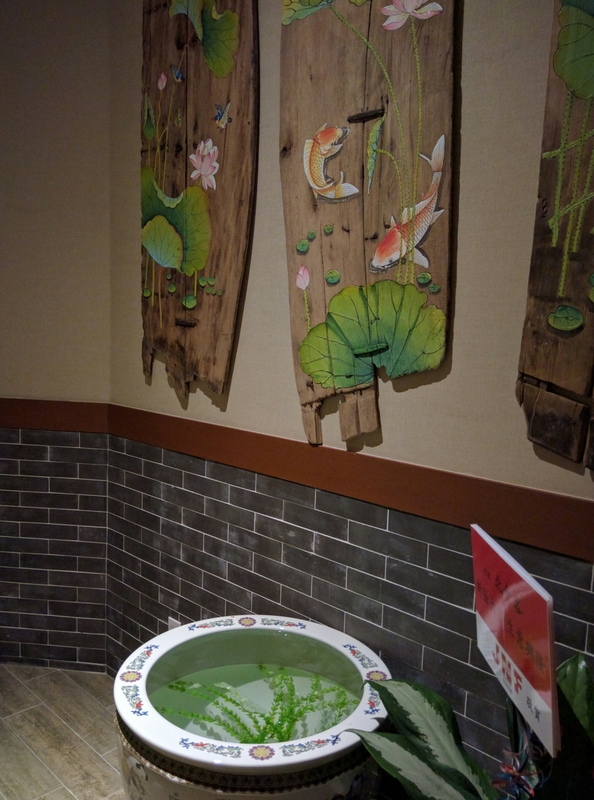 It is located where Golden Turtle used to be. 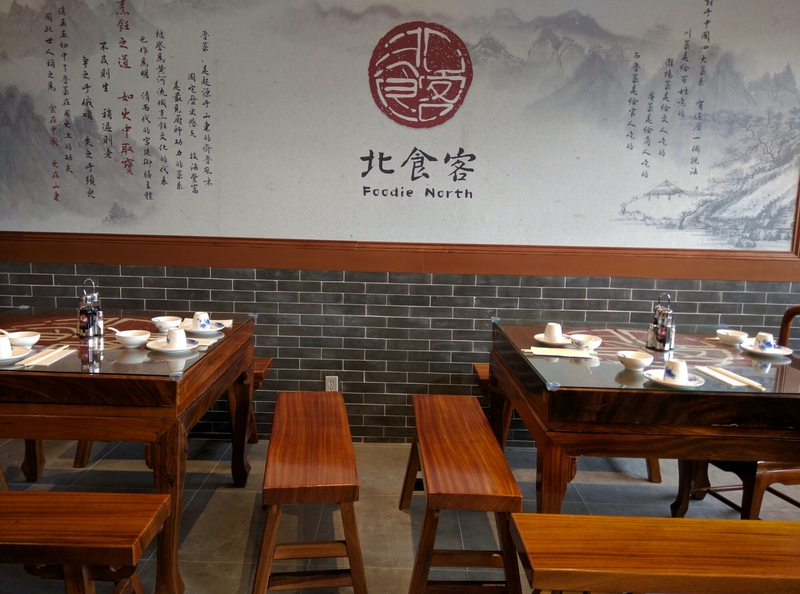 Also, Presotea is located inside Foodie North, which is great for the high school kids next door. I love Presotea. Foodie North is BEAUTIFUL! From the beautiful red double doors to the intricately decorated interior. 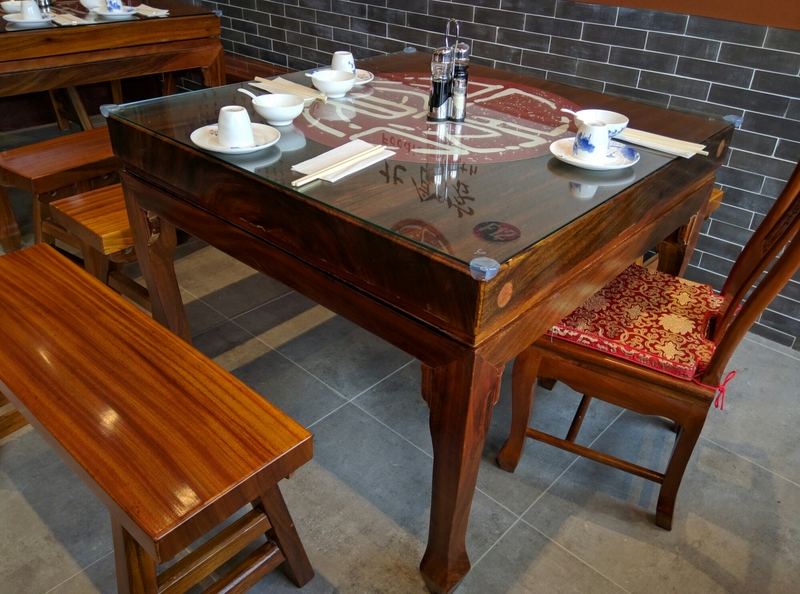 The window panels to the tables are very intricate, no detail left untouched. 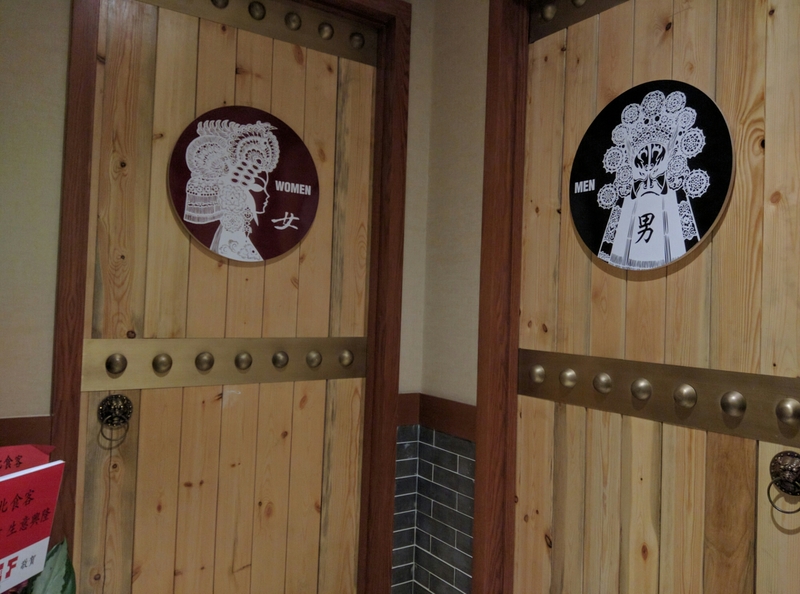 Even the washrooms are beautiful. Even the menus, and tableware. 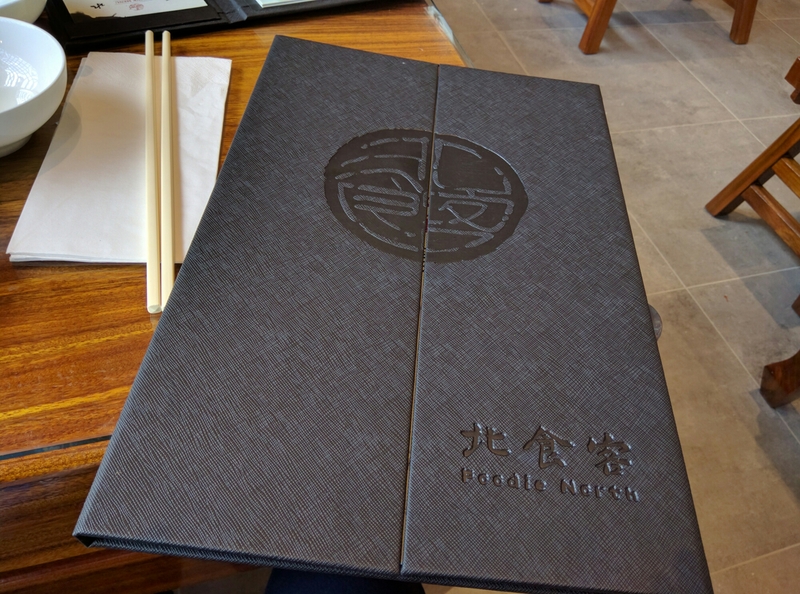 The menu is extensive offering everything from dumplings to soups to seafood to vegetarian; even a nice selection of desserts, and of course bubble tea. You can see their full menu on their Facebook page. First, we were presented with a hot pot of tea. 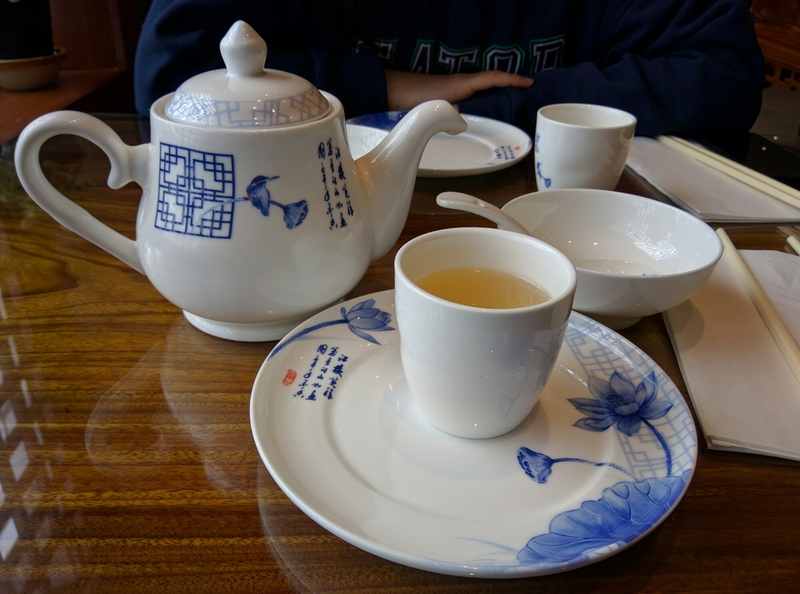 This is not your typical Oolong or Jasmine tea normally offered at Chinese restaurants. 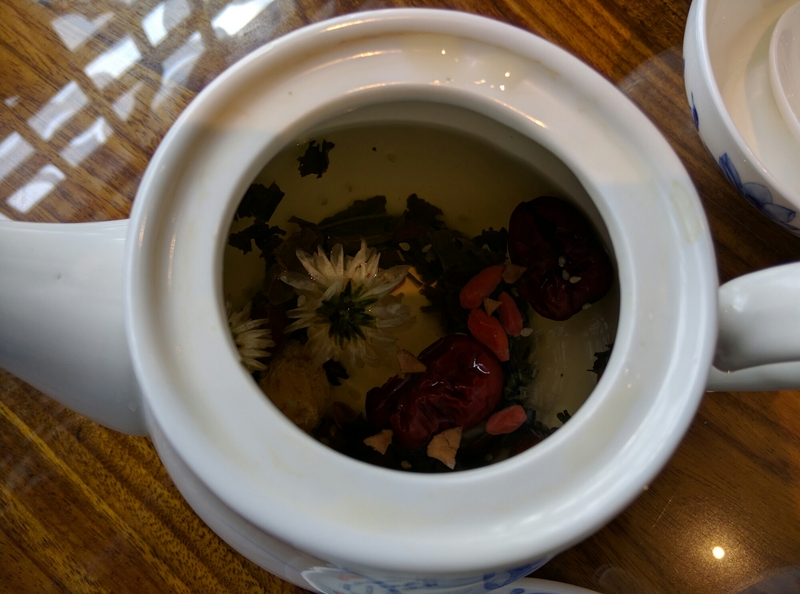 This tea was made of dates and goji berries and flowers and tea leaves, and it was sweetened. 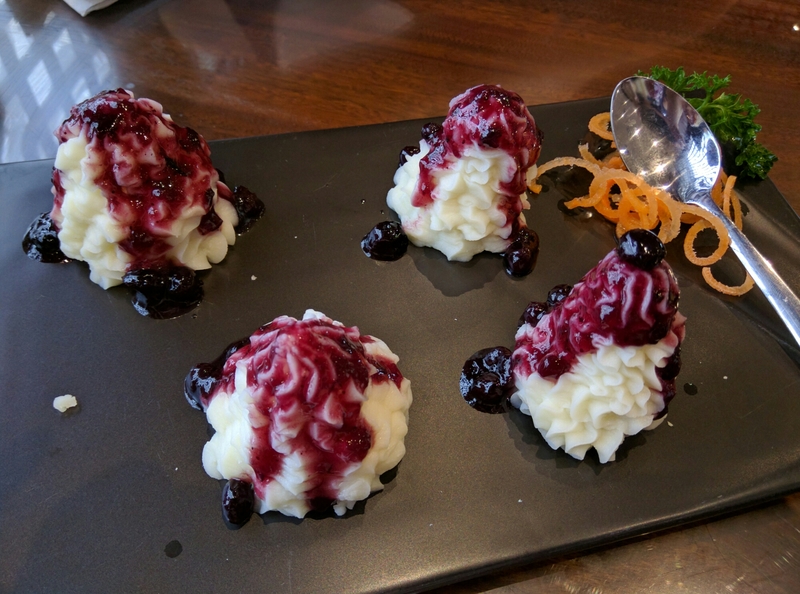 There was a photo of this on the menu and it looked good and interesting. 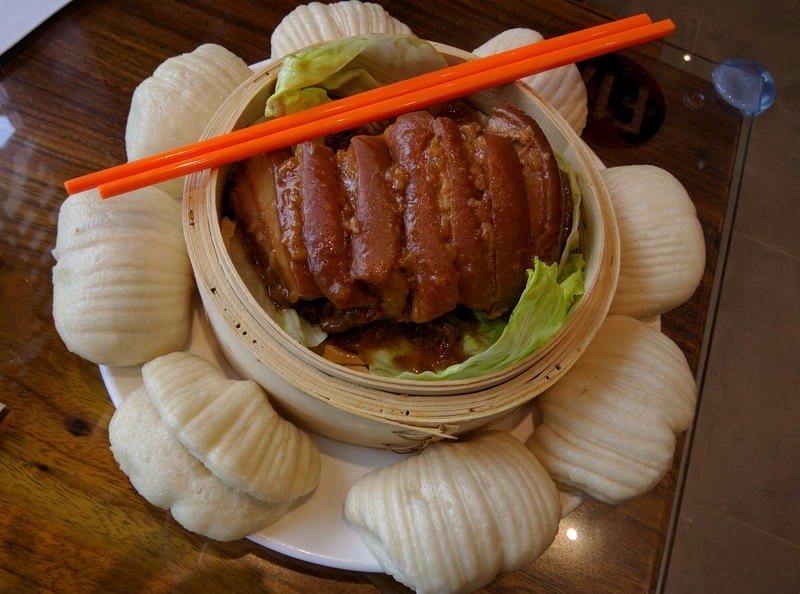 What arrived was a beautiful presentation of eight pieces of fresh steamed bao, and a basket full of sliced pork belly. The pork belly layed on a few pieces of fresh crispy lettuce, and was lightly coated with a sweet tasting sauce (not too sweet). We gobbled this down. 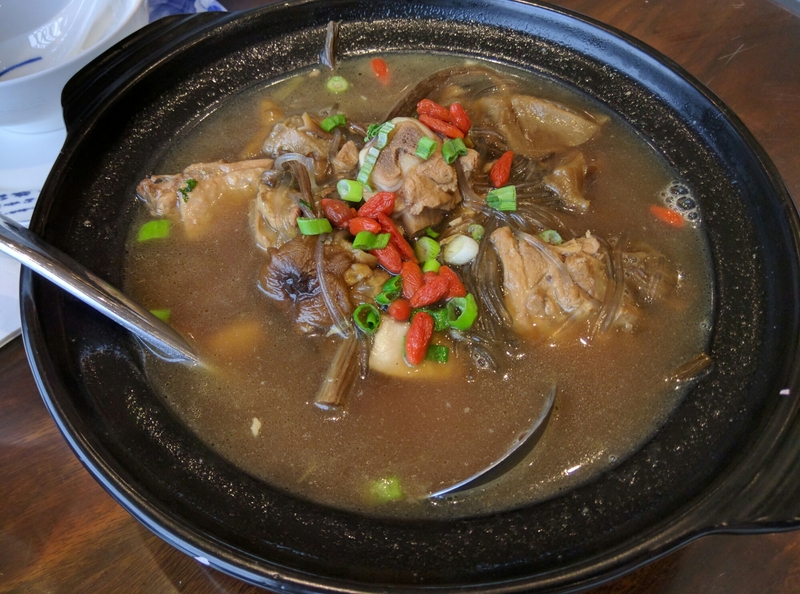 Then we had #6013 Yu Shiang Eggplant in Casserole. 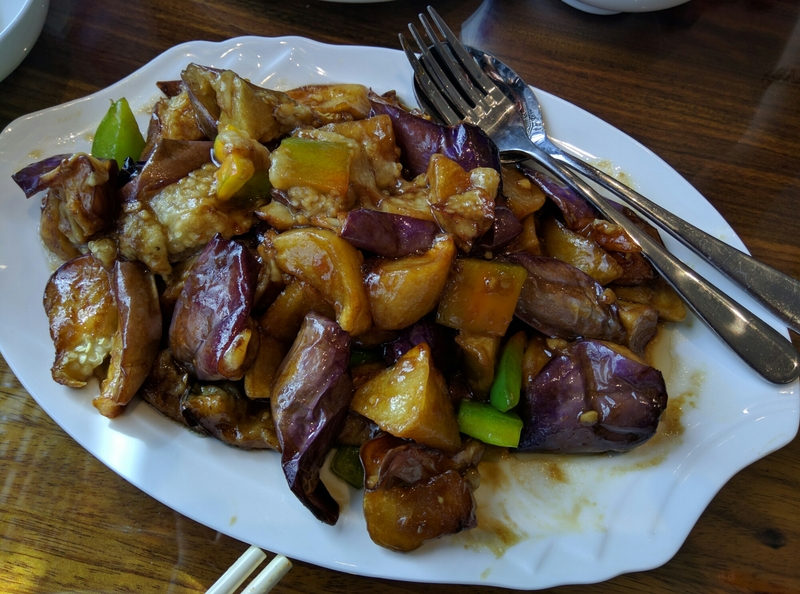 This was a mixed dish of eggplant and potato. It was quite interesting, the potatoes has a crisp to the edges and do I taste a hint of curry overall? A shiny glaze was drizzled over top. 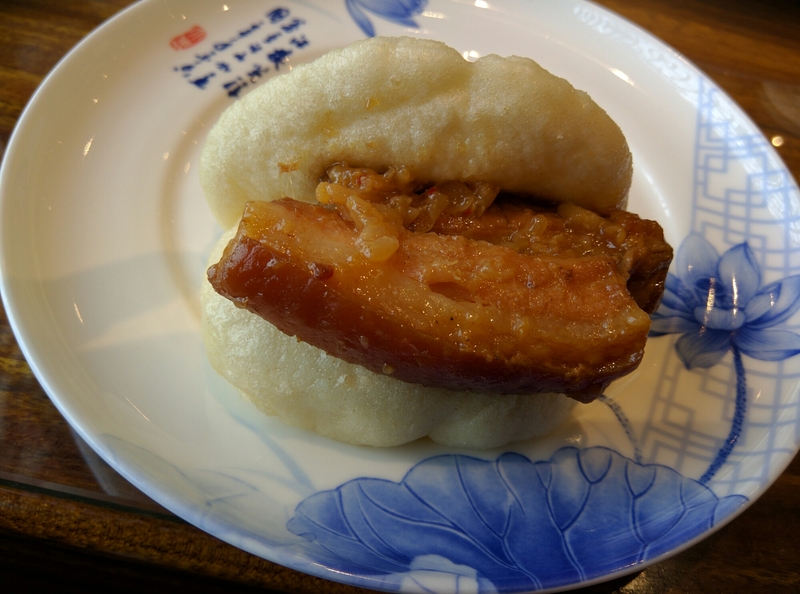 We ate this with a bowl of steamed rice. Since we had no more room to order dessert as we originally planned, instead we ordered a bubble tea to take out at the end of our meal. We arrived at Foodie North at 4:30pm so it wasn’t busy yet. But as we left at 6:00pm, more and more diners started arriving. There were basically only two servers, so I do hope more staff came on board after we left. I think Foodie needs to coordinate their service a bit, however I don’t think that will be a problem in the coming days or weeks. We were pretty satisfied with the service despite a few little quirks. We went back for dinner today. Service is still a little weird. They seated all the diners in one corner, then the servers seemed to forget to come back to us to get our orders. Every single table were waving our arms trying to get someone’s attention. They definitely need to improve on attentiveness. They no longer serve that nice sweet tea. or at least today, we only received a plain tea. 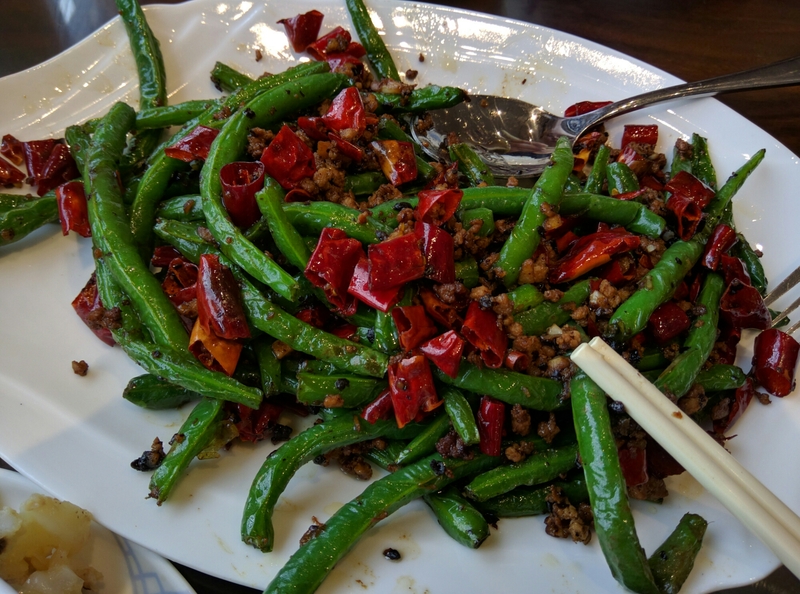 Here are photos of what we ate. Stewed Chicken and Mushroom Soup, Dried Green Beans With Minced Pork, and Mashed Yam With Blueberry Jam.